Lil' Bits "Truly Madly Deeply" adds to your digital element possibilities for this kit. The Milk caps, the wordart signs, and of course the words all say one special thing....Love! 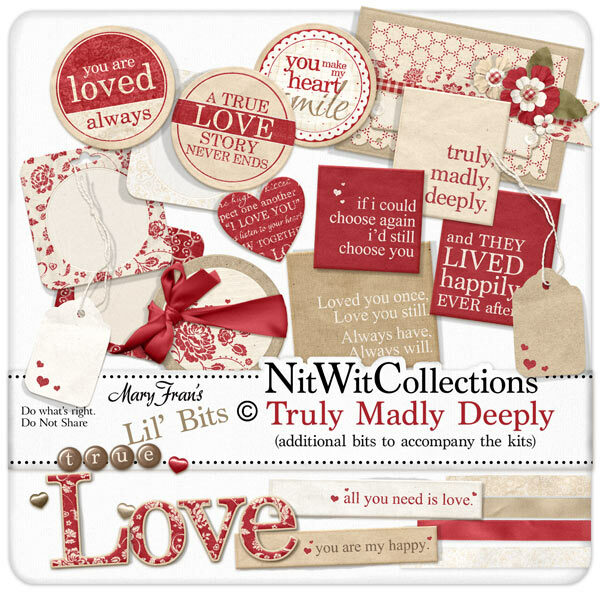 These digital elements are NOT included in the FQB "Truly Madly Deeply" Collection so don't pass these by! 4 Satin ribbons - do it with class! 1 Wordart sign - "Loved you once...."
1 Wordart sign - "And they lived...."
1 Wordart sign - "Truly..."
1 Wordart sign - "If I could..."
1 Wordart sign - "All you need is Love"